Marshes, fens, wet shores, moist hollows and thickets, ditches, even occasionally tamarack swamps. The leaves vary from nearly linear to broadly lance-elliptic. Hybrids with L. quadrifolia are also wide-leaved, but with some leaves in whorls of 3 or 4 and a tendency to have some axillary inflorescences. This occasional hybrid is L. ×producta (A. Gray) Fernald. Hybrids with L. thyrsiflora (L. ×commixta Fernald) have wider leaves than usual for L. terrestris, all opposite, and denser inflorescences with a tendency for some to occur in the axils. This hybrid has been collected in Alger Co. Wounds to the apex of a plant may result in the growth of lateral branches with terminal racemes, and such plants should not be confused with hybrids. Lysimachia terrestris develops, late in the season, conspicuous sessile, reddish, segmented bulbils to 2 cm long in the upper leaf axils that presumably function in vegetative reproduction. In one vegetative population (Albert, s.n. Oct. 1, 2017) of apparent L. thyrsiflora from deeper water (ca. 60 cm), submerged olive-green bulbils up to 3.5 cm long, somewhat similar to those of L. terrestris, were documented, but appearing terminal, either on the stems or on short to long branches from the lower nodes. Features of bulbil production in these species need to be studied. 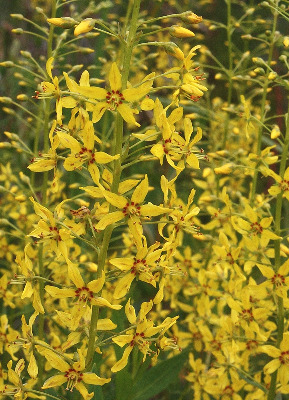 Lysimachia terrestris and L. thyrsiflora are both common wetland species and can be quite similar vegetatively. Distinguishing them without inflorescences is not straightforward. Lysimachia terrestris, has leaves that are often narrower than L. thyrsiflora, with conspicuous revolute margins, and apparently always glabrous. The black flecks on the leaf are sometimes inconspicuous, more diffuse-edged, often elongated and less symmetrical than those of L. thyrsiflora. In addition, the underside of the leaf in L. terrestris has the lateral veins inconspicuous, quite faint where they lie parallel close to the leaf margin, and the black specks between the veins running along the leaf margin and the leaf edge are inconspicuous and irregular. Lysimachia thyrsiflora often has much wider leaves, the margins mostly only slightly revolute, and sometimes the midvein on the underside of the leaf and even the stem is sparsely pubescent with cobwebby, septate hairs (though not when aquatic). The black flecks on the leaves of L. thyrsiflora vary in size, but are always conspicuous, round or nearly so, and well defined. In addition, the underside of the leaf in L. thyrsiflora has clear lateral veins which arch and are still conspicuous as they run parallel close to the leaf margin, and there is usually an especially prominent series of black dots between the vein running along the leaf margin and the leaf edge. MICHIGAN FLORA ONLINE. A. A. Reznicek, E. G. Voss, & B. S. Walters. February 2011. University of Michigan. Web. 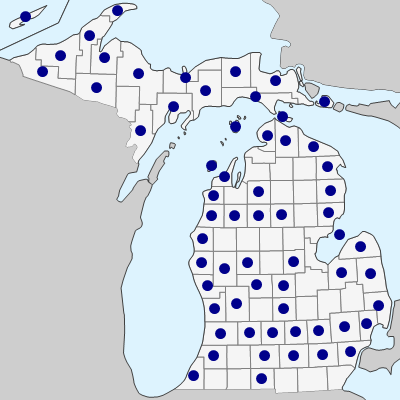 April 24, 2019. https://michiganflora.net/species.aspx?id=1716.